My foil stamp or emboss design go beyond the safe margin. No, My foil stamp or emboss design is within the safe margin. The 16pt gloss stock is a popular choice for people looking for an affordable option and high end print features. 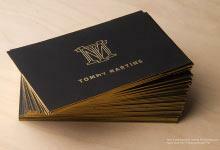 The pricing includes a smooth silk lamination over top the card stock, 2 sided offset printing and 2 sided Spot UV. Foil stamping is also available for this card stock for an additional fee. Spot UV looks great on logos, larger text, and can also be used to create a transparent pattern over top of the card. * Add 2-4 business days for the following features: Die-cut corners, embossing, or foil stamping. *Please inform our orders department if you have any upcoming specific deadlines even if the day is outside of our regular turn-around time. This allows us to proceed accordingly if there are any production delays.